NATDAC (daclatasvir), an NS5A replication complex inhibitor, is the first 12-week, all-oral therapy indicated for use with Sofosbuvir, for the treatment of hepatitis C (HCV) genotype 3 infections. 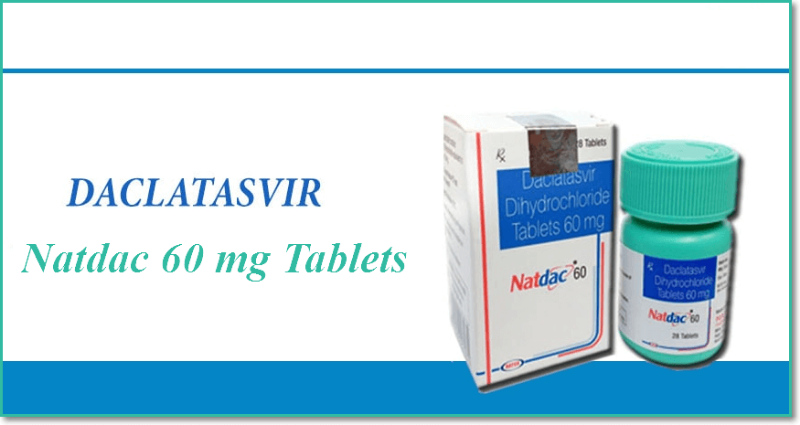 Natdac (Daclatasvir) is a high-class drug aimed at fighting the “Hepatitis” virus of various types. By inhibiting the multiplication of the virus at the cellular level, Natdac stops the spread of the virus and allows for a sustained virologic response of the human body. This drug contains Daclatasvir dihydrochloride and is sold in a jar containing 28 tablets. Natdac is available in the form of tablets in dosages of 60mg for oral administration only. It is usually taken with or without food once a day. Daclatasvir must be taken in combination with Sofosbuvir, usually for 12 weeks. Take daclatasvir at around the same time every day. Follow the directions on your prescription label carefully, and ask your doctor or pharmacist to explain any part you do not understand.